Another busy weekend coming up, again early predictions time. I'll probably throw this in the dump after practice. Last edited by CarlPotter on Fri Mar 29, 2019 1:25 pm, edited 1 time in total. I've chickened out. I don't believe Mercedes has lost their advantage. Last edited by Exediron on Sat Mar 30, 2019 3:42 am, edited 2 times in total. But will that be countered by my editing of my picks to predict a Merc victory? Only one of our edits can go badly wrong! Any chance people are going to forget I ever edited this? Results will probably be up some time tonight, after I stop raging about the result! The Bahrain Grand Prix did its best to make up for the lack of action in Australia, delivering a storming race from start to finish, with excitement, drama and heartbreak littered throughout along with the pieces of several cars. But while the action was tense up and down the field, it's the fight for the podium that we care about here in CarlPotter's Top Three Championship. On that front, things were looking set for a very low scoring round when Leclerc led away from pole, with only a single entrant having predicted the young Monegasque to take victory. That fell apart along with Charles' engine, however, and with Hamilton and Bottas swooping past to take a Mercedes 1-2, predictions started to click Nobody managed to fill out the first Perfect Podium of the year, however, so victory goes to those who had foreseen the dominance of the Silver Arrows - albeit probably not in the way it came about! Congratulations to Charles LeBrad, Jezza13 and Icemanjee1 for taking victory in Bahrain! Special mention goes to Herb, Jenson's Understeer and robins13, all of whom changed their predictions from a point-scoring one to something much worse. Having not started a single GP this year, jzusy will be declassified pending a third DNS in China. Five individuals share the joint points lead with 8 points apiece, but the tie is broken in favor of the three with a higher single points haul - meaning that the three joint winners of this round are also the three joint championship leaders at present. The field is separated from top to bottom by less than a Perfect Podium, so it's clearly still early days. Bentrovato, coulthards chin, Espo, mcdo, Mod Blue, Remmirath, Mod Onyx and jzusy are all yet to score their first points of the year, and will be anxious to do so in China if they are to avoid conceding a large early gap to the leaders. Things are a little more complex in the team standings. The clear winner of this round is Management in Crisis, who take a solid 5 points for each of their drivers and the championship lead, sitting on top at present with 13 points. They are followed closely by the 2017 champions Jalopy Racing, who had a good day themselves with 9 points scored, and the newly-named Mission Copy James, who scored the same result. They sit tied for second place on 12 points each. Another point back in fourth position is the rookie team Victorious Secret, who must surely be pleased with their start to the campaign; they sit two points ahead of the defending champions No Limit Excedrin Racing, who are on 9 points. Behind them Lotus-CC Racing and Sand Bag'n are tied for sixth place, with 8 points apiece. The Also Rans are a further point back in eighth (erroneously marked as 7th on the standings), and new team We The North rounds out the point-scoring teams in ninth place. Crisis in Management and Drive Sauber sit tied for last at present, with neither outfit having yet scored a point with either driver. The Chinese Grand Prix is next in two weeks' time. Another traditional track, the Shanghai International Circuit is likely to feature a form book more Bahrain than Melbourne. 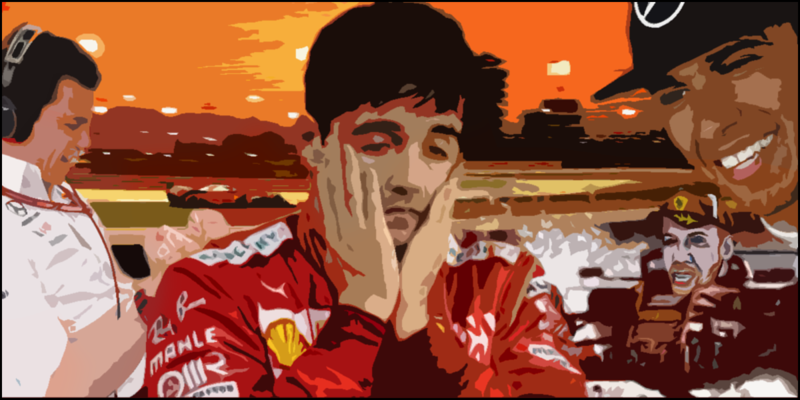 That ought to mean a close fight between Ferrari and Mercedes - but with Leclerc in ascendance, picking the winner may no longer be as simple as Ferrari or Mercedes. And that can only be a good thing for our competition! Best line: "Special mention goes to Herb, Jenson's Understeer and robins13, all of whom changed their predictions from a point-scoring one to something much worse." I scored zero points so maybe I shouldn't be laughing. Good work Charles LeBrad, maybe we can both score points in the next race! Scored my first points! I completely forgot I picked Hamilton to win but happy I did. I needed to bounce back, after binning it in Aus. We'd be leading if it wasn't for that!